شاهچراغی, آزاده. (1394). چهارباغ یا چارباغ؟. مجله علمی-ترویجی منظر, 7(30), 6-13. آزاده شاهچراغی. "چهارباغ یا چارباغ؟". مجله علمی-ترویجی منظر, 7, 30, 1394, 6-13. شاهچراغی, آزاده. (1394). 'چهارباغ یا چارباغ؟', مجله علمی-ترویجی منظر, 7(30), pp. 6-13. شاهچراغی, آزاده. چهارباغ یا چارباغ؟. مجله علمی-ترویجی منظر, 1394; 7(30): 6-13. «چهارباغ» صحیح است یا «چارباغ»؟ این سؤال اصلی نوشتار پیش روست. هرگاه برای فهم عمیق‌تر این پدیده به متون تاریخی، کتاب‌ها، سفرنامه‌ها، زندگینامه‌ها و حتی کتیبه‌ها سر می‌زنیم مشاهده می‌کنیم که واژه «باغ» به عرصه‌ای دلپذیر، پر از گل، گیاه، درخت و آب جاری، اما منظم و برپایه هندسه‌ای مشهود، اطلاق شده است. در این میان«چهارباغ» یا شاید «چارباغ» اشاره‌ای به الگوواره نظم‌دهنده به آب ، گیاه و بنا در عرصه‌ای به نام «باغ» است. اما سؤال اصلی اینجاست که چرا گاهی در متون علمی و ادبی حرف «ه» از واژه «چار» حذف شده است. آیا دلیل ویژه‌ای برای این امر وجود دارد یا صرفاً به مرور زمان و در افواه عمومی این حرف حذف شده است. البته بعید است فرض دوم صحیح باشد زیرا در متون ادبی که معمولاً نویسنده آن بر نگارش صحیح واژه اصرار داشته است نیز واژه «چارباغ» به چشم می‌خورد. از این رو این نوشتار براساس بررسی تطبیقی اسناد در دسترس - اما محدود- دودمان شناسی واژه و تطبیق آن با شکل‌شناسی، به کنکاش این موضوع می‌پردازد. Most of the researchers noted that CHARBAGH is the most important pattern of Persian garden and it is an "Archetype". In other side we have CHAHARBAGH which is formed by two perpendicular axes in garden and divide it into four square shape parts. This paper aims to challenge "Chahar-Bagh" Or "Charbagh" ,which is correct? So, that is the main question. 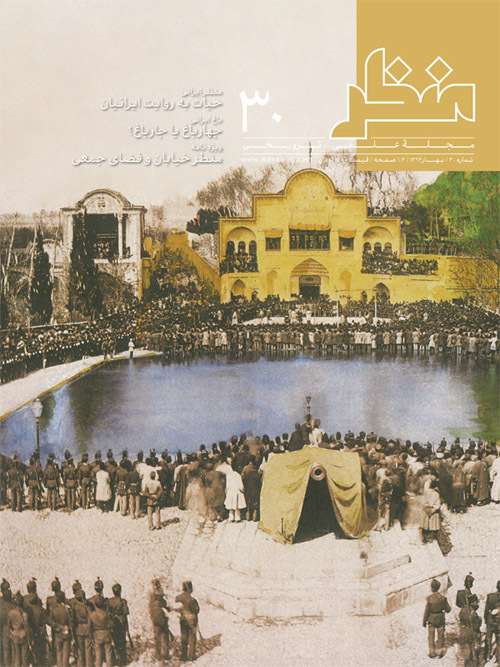 In order to find the answer, with a deductive approach, the paper tries to recognize all the documents about "Chahar-Bagh" and "Charbagh", among historical documents such as, the first documents of PASARGAD garden, available historic books: IRSHAD-OL-ZERA-E, ROZAT-OL-SEFAT, BABURNAMEH and we search it in Achaemenian inscription, and also in Persian miniature and Persian garden-carpet. In most of the historic books we can find, description of un-axial pattern for creating Persian garden. We could not find any words which means CHAHAR (Four) in available Achaemenian inscriptions. In Persian Garden –carpets and Persian miniature we can observe both patterns of CHAHAR-BAGH archetype which includes: two perpendicular axes pattern and uni-axial pattern as we see the same in Persian Miniatures. In conclusion we can form a hypothesis which tells us, shaping four square shape parts or CHAHAR-BAGH garden is related to the Safavid period. Iranian built un-axial garden before that period and call it CHARBAGH.